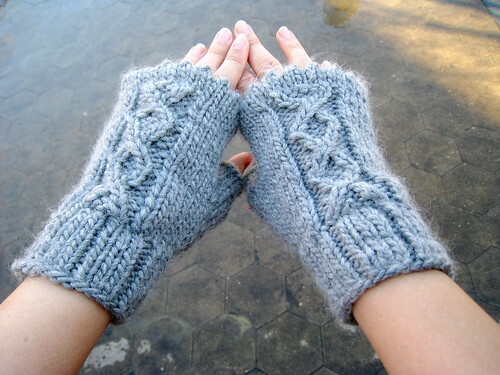 I made these in 2008, but it took me a while to blog about them because I wanted to put a pattern together. They’re super-duper easy. I came up with them on CalTrain on the way back from Purlescence. You can follow the more traditional instructions that are in the PDF (link at the bottom of this post) or just make up your own–knit a bit of ribbing in chunky yarn, throw together a cable (I just knit the easiest one I could think of), make a thumb gusset, picot edging off and ta-da! You’re done. These literally took me three days. Oh, and they’re called MittSF because they were designed and knitted in San Francisco and also because it sounds like mitzvah, a charitable act, which it certainly would be if you made a pair for a friend. Also available on Ravelry here. mmmm. those look warm! and pretty!